I don't have to tell you that chalkboard is everywhere, you already know that. But, did you know it is in the dollar section at Target?! I got awesome chalkboard labels there! When I saw them, I knew exactly what I wanted to do with them. I have seen these jars at Anthropologie many times and always thought I could make them rather than spending way too much money on them there. I just so happened to be making spaghetti one night last week and it dawned on me to use the sauce jar for this little chalkboard project! While the jars at Anthro are smaller, these can hold more, which can come in handy. While I was at it, I got carried away with some chalkboard paint for my own take on the jars, too. Spray paint your glass jar. Use light coats and wait until each coat is dry to spray on another layer. I sprayed about 3 layers on mine to get my desired color. Spray paint the lid separately. Doing so will make it easier to paint with your acrylic color later on. Once completely dry (I allowed mine to dry overnight) apply your chalkboard label where ever you want it. 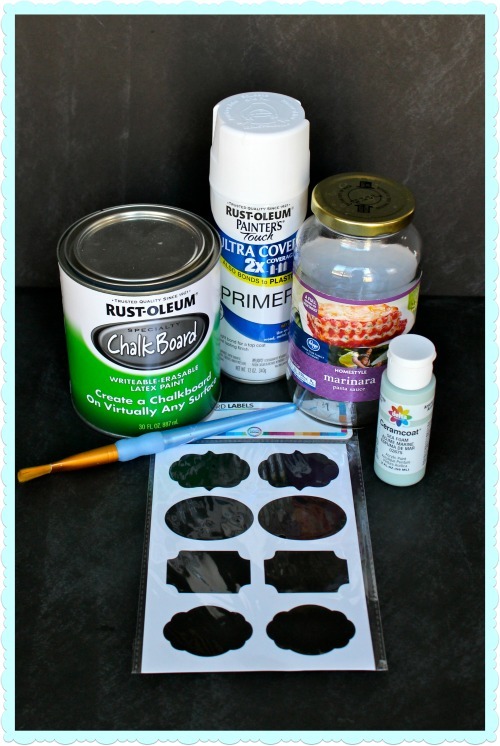 If you cannot find chalkboard labels, you could trace a design and use chalkboard paint to paint on your own label. Paint the lid with the acrylic paint color of your choosing. Allow to dry between coats. Again, I used about 3 coats on mine. Done! Use for storage or as a decorative item in your kitchen or home office. 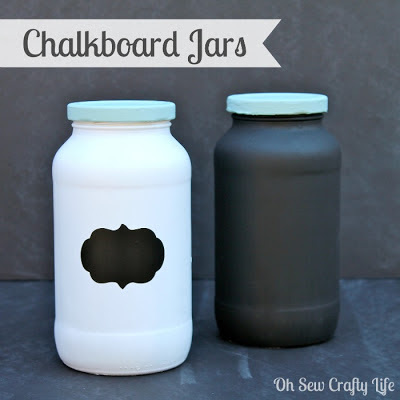 Paint your glass jar with chalkboard paint. The chalkboard paint tends to show brush marks easily if you aren't careful, so apply smooth, even brush strokes. Allow to dry (about 20 minutes) in between coats. I used 3 coats until my jar was completely covered with none of the glass showing through. Paint your lid with one layer of the chalkboard paint. This will help the acrylic paint adhere to the lid better, and save you a few coats of paint. Allow to dry. Paint the lid with the acrylic paint. Allow to dry. Decorate/ label with chalk and you're all set! Hey there! Here from the Blog Hop! Just wanted to let you know I'm following you via Bloglovin' and Pinterest! Hope you'll get a chance to check me out! I'm stopping by today from the Pin it Tuesday Link Party. This is such a great idea - and really simple (I love that!) I'm pinning it to my 'DIY gifts' board. these are cute!! I love the labels! Thank you Deborah! :) Have a great day! I just got given a dozen mason jars - I was just going to cover them with burplap and twine, but now you've given me inspiration to go one step further. Hi, stopping by from Jenny Evolution. I love the look of these jars. I have a lot of these laying around and this would be a cute idea to use them. Thanks for posting it. 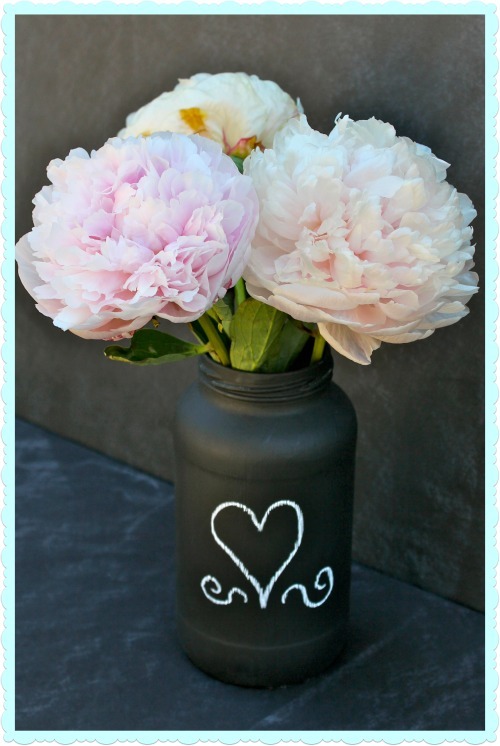 These are so cute ... and now I'll be scouring my Target dollar bins for chalkboard paint! Who knew!!!??? These are so cute! Thanks for sharing! Don't you love what you can find in the Target dollar bins?!? Thank you Allison! Yes, I love those bins! :) Have a good day! What a cute idea and so simple. they look adorable. Thank you Bev! Hope you have a wonderful week as well! Thanks so much for sharing at my Twirl & Take a Bow Party. Stop by House on the Way tomorrow to see your chalkboard jars featured! love the idea! seriously, what can't we use with a little paint!?!?! I just told my husband about chalkboard paint and how I want to use it to put a small menu on our kitchen wall and to paint my mason jars in my new kitchen. great timing and great project! Stopping by from the On Display Monday Link Party. Coming from the HouseontheWay Link party. These are sooo cute!! I have got to find some of these labels!! Good timing! Now you can give him an answer, lol! Thank you for stopping by! I have wanted to paint jars....now I REALLY NEED TOO!! these are so fun!! Thank you so much for sharing at Redoux! I didn't know you could buy the chalkboard labels at Target, getting some ASAP! Yay! Hope you finally get that jar out from under the sink! :) Have a great day! 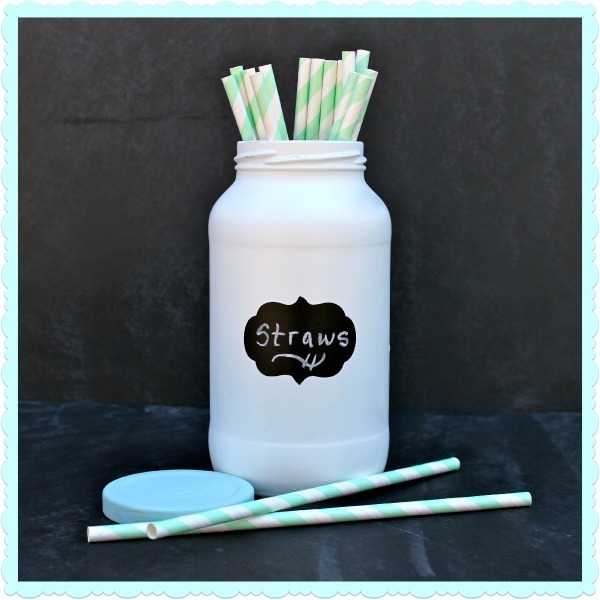 Love this idea and Mason jars! This is such a cute idea!! Can't wait to try it! Pinned it! Thanks so much for sharing with us this weekend at One Sharendipity Place! We buy honey in gallon jars and I love using them for storage, this idea will work great on them! Found you at Pinworthy Projects... these are totally pinworthy! Love them... pinning!! These are really cute. I've seen a lot being done with chalkboard lately. Thank you! And thanks for hosting :) Have a great night! Love these! Thanks for sharing! Stopped by from the And Sew We Craft Together linky party. So cute!! There are so many creative ideas with chalkboard paint. 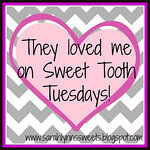 I would love for you to share this on my Sweet Tooth Tuesdays link party. It's not just for recipes, but DIY projects and crafts too. I'm sure my readers would love this idea. Very cute Alyssa. I love anything chalkboard. Guess I need to head to Target. thanks for sharing with SYC. 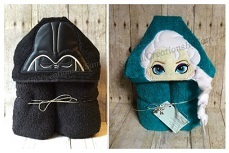 And thanks so much for linky up with And Sew We Craft Together! So cute! I'm obsessed with chalkboard paint right now, so this is right up my alley! And the labels are perfect. Great Target find! Oh my word, these are ADORABLE!!! You did an amazing job Alyssa!! Love the multi use of these! And they look great too! Pinning to my jar board. Thanks for sharing at All Things Pretty!